By William Mackay: Former British and Commonwealth heavyweight champion Dereck Chisora (15-3, 9 KO’s) is facing a possible permanent loss of his boxing license by the British Boxing Board of Control, who are investigating Chisora’s actions during his post fight press conference last Saturday night in Munich, Germany, in which Chisora and David Haye were involved in a brawl. There is a potential that Chisora could receive a lifetime ban by the BBBofC due to his comments made during the press conference where he said he wanted to shoot and burn Haye after being punched by him. Those are obviously very serious threats to make when it involves a possible life endangering threat. 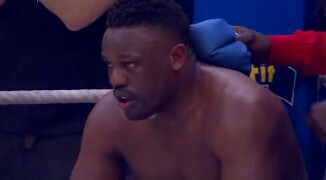 Since Friday, Chisora has shown some very questionable behavior, slapping Vitali across the face during the weigh-in on Friday, spiting water in Wladimir Klitschko’s face before the fight, and then the final straw when Chisora got up during the post-fight press conference and walked into the crowd to dare Haye to tell him that he didn’t want to fight him. Haye punched Chisora at that point, which ignited a brawl. Chisora shouldn’t have gotten out of his seat to walk up on Haye, especially when Haye already threatened to give Haye “Two slaps” during the same press conference. Haye obviously couldn’t dismiss this as just idle chatter because Chisora had shown himself to capable of assaulting an opponent when he slapped Vitali without warning last Friday. In the past, Chisora has bitten an opponent during a fight and kissed another hard on the mouth during a face to face meeting. The latter two incidents won’t be what the BBBofC will be looking into during their investigation but it shows you that Chisora can be very unpredictable at time. When you listen to him talk, he comes across as being quite intelligent, but he’s got a hot temper and seems to make decisions without thinking things through. He may have seen the Vitali slap and Wladimir water spitting as something that would help his career. But if so, he misjudged it because he reportedly was fined by the WBC for the Vitali slap. and he could end up losing his boxing license for the brawl with Haye. Chisora would obviously relocate to another country if he lost his boxing license, so it wouldn’t be the end of his career or anything. In another front, the German Boxing Federation is looking to have Chisora banned from fighting in Germany. That’s a big deal because it would make it very difficult for him to fight the Klitschkos again because they as champions wouldn’t likely be agreeable to fighting Chisora, a mere contender, in the UK.